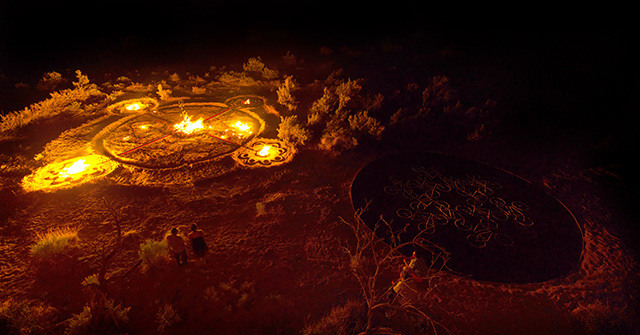 (Forecast Public Art, 21 January 2105) – In late June, beneath a blanket of stars in remote Coyote Canyon on the Navajo Nation, I stood at the edge of a cliff with a small group and watched as the center of Bert Benally’s sand art piece ignited and sent flames radiating outward to slowly reveal the intricate designs placed at the four cardinal points of the perimeter. The flickering light illuminated the white porcelain pottery shards of the neighboring piece, a complex, symmetrical pattern with a repeating bicycle motif designed by Ai Weiwei. A recording of ambient sounds captured in the region filled the cavernous space. I was one of the few to witness Pull of the Moon, a temporary, site-specific land art installation which is part of Temporary Installations Made for the Environment (TIME), a partnership between New Mexico Arts, Navajo Nation Museum, and the International Land-Sensitive Art Foundation. Pull of the Moon was a collaboration between Chinese dissident artist Ai Weiwei and Navajo artist Bert Benally. The project not only broadens the typical perception of what constitutes public art, but also posed the challenge of creating a work of art rooted in the Navajo tradition and presented in an innovative way. The temporal nature of Pull of the Moon is aligned with Navajo aesthetics. “The Navajo embrace the idea that art is more about the process than the finished product,” explains Benally. Shortly after the installation, nature cleared any trace of its occurrence. This impermanence, coupled with the work’s remote location, inspired a multifaceted approach to sharing it with the public. A documentary film entitled Bert & Weiwei: TIME 2014, by Daniel Hyde and Blackhorse Lowe, focused on the collaborative exchange between Benally and Ai, who is forbidden to travel outside of China. It premiered at the Museum of Contemporary Native Arts in Santa Fe on July 16, 2014. The opening also featured a live performance by German sound artist Robert Henke and Benally based on sounds captured at Coyote Canyon. Another approach to documenting the work came from xRez Studios, which captured the installation and surrounding area to reconfigure it as a 3D digital landscape film. Audiences had the unique experience of being fully immersed in Pull of the Moon when this film was projected onto a mobile geodesic dome (one of only three in existence) at Museum Hill in Santa Fe in July 2014. A tour is planned for the dome and film in an effort to share Pull of the Moon with as many people as possible. Benally’s starting point in the creative process is always the Navajo people. While working on Pull of the Moon, he wrestled with trying to create an installation that would be appreciated by Navajos, while also presenting the material in a completely different manner from what had previously been seen. He felt that as long as he maintained that firm foundation, he could incorporate modern technology. Sand paintings are one of the traditional Navajo art forms. Benally’s installation also drew on the concept of the medicine wheel, with a large earthen vase at the center representing prejudice, and four images illustrating Navajo culture on the periphery. Four blue and red troughs connected them and were meant to portray rainbows. The central vase was first to be lit on fire. As it burned, taking the symbolic prejudice with it, a cornstalk sculpture—sacred to the Navajo and viewed as their essence—was revealed. This strong sense of cultural heritage was also a key element in site selection, according to Navajo Nation Museum Director Manuelito Wheeler. “One of the objectives of this project is to connect art with cultural landscape,” he explains. Coyote Canyon has a rich cultural history for the Navajo; the temporary installation drew on those cultural resonances, and “when it travels to different locations it will carry the power of the initial place with it,” says Wheeler. Zimmer echoes this aim. “From the beginning our intention has been that the land itself be the starting point, a blank canvas for artists to transform through their creative process into something larger, something that can bring healing and harmony to the land and to the community,” he says. There were valuable lessons learned during this process that will guide the future stages of presenting Pull of the Moon. The temporary installation was not open to the public due to its remote location and lack of facilities; in hindsight, it would have been possible to issue limited access on a first come, first serve basis as was done with members of the media. Additionally, being present at the temporary installation in Coyote Canyon or at the dome was a moving experience for many. It would have been interesting to have an online discussion forum set up for people to share their thoughts on Pull of the Moon. Notable not only for its cultural significance but also for its innovation, the project expands the concept of how public art is created, where it is displayed, and how it is shared with audiences. Beginning with the stunning landscape of Coyote Canyon and through an international collaboration, both artists embraced the temporal nature of the project. Great effort was taken to honor the Navajo tradition while incorporating new techniques. Innovative technology was used to capture the installation and then share it with the public in a unique way.